Hiking to Death Valley National Park’s highest peak can be challenging, but you don’t have to be an expert to tackle the rewarding trek. Seeing some of Death Valley National Park’s best scenery requires going up—way up. 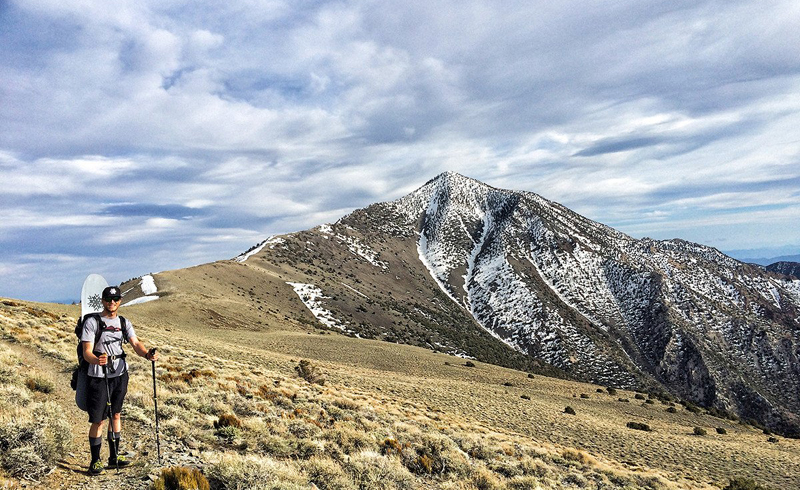 The journey to the top of Telescope Peak (11,049 feet / 3368 m) gives hikers a chance to experience the park’s most diverse landscapes, while offering a strenuous challenge. The National Park Service rates the Telescope Peak hike as “difficult,” a sentiment shared by several other hiking sites. However, that doesn’t necessarily mean you should avoid the trek if you’re a novice. At 14 miles (22.5 km) and seven hours for the round-trip journey, the hike is doable by anyone in good physical condition who takes the proper precautions and visits during the summer months. Here’s how to make a trip to Telescope Peak. Hikers can drive straight to the trailhead at Mahogany Flat Campground (8200 feet / 2500 meters). The final two miles of that road are rough gravel, so 4x4 high clearance vehicles are strongly recommended. Do nottry to come with a rental car, or you just might get stuck paying fees for dings and scrapes. Camping is free and first-come, first-serve, but the 10 sites typically do not fill up, especially if you avoid holiday weekends. The campground officially closes during winter, though it may be open past December if weather permits. Mahogany Flat serves as a good spot to settle in and adjust to the altitude overnight. If you’re determined to make a winter visit and the road to Mahogany Flat is closed, try staying at nearby Wildrose Campground. In the morning, drive to the gate at Charcoal Kilns and walk to the trailhead from there. This adds an extra 1.6 miles (2.6 kilometers) each way to the hike. Rise and shine! Most hikers wake early and begin the trek in the morning. Once you’re on the trek, you’ll pass through forested sections and some oddly shaped bristlecone pine trees before open meadows come into view. Depending on the time of year, you may see wildflowers in bloom and bighorn sheep milling around (so make room in your pack for a camera if you want to capture snaps of the wildlife). Eventually, you’ll hit a series of exhausting switchbacks—but stick with it: These strenuous switchbacks signal that you’re almost at the summit. Keep pushing, and you’ll soon discover the expansive views from the top that inspired the “telescope” portion of the name. Hikers who visit the summit on a clear day may be able to see both the lowest and highest points in the lower 48 United States, with Badwater Basin (-282 feet / -86 meters) two miles below and the 14,505-foot (4421-meter) peak of Mount Whitney in the distance to the west. 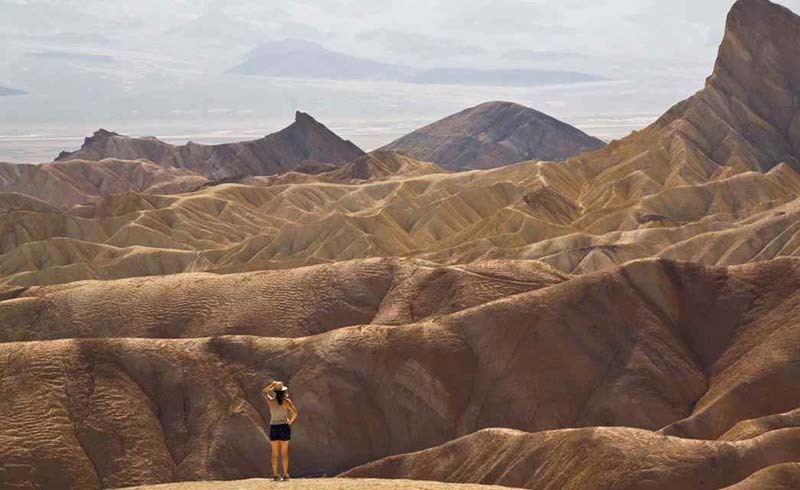 The weather for hiking Death Valley is ideal from July through September, when your main challenges will be sun, heat, and lack of water (on that note: don’t forget to BYO H2O). Wear sunscreen and comfortable, lightweight clothing, and have some warmer clothes for the chilly evenings. Hiking to Telescope Peak in the winter is a completely different experience, and one you’ll want to avoid if you haven’t built up the necessary skill and equipment to traverse icy terrain. Only experienced climbers should attempt a winter summit, as snow and ice typically cover much of the route. You will most likely need an ice axe and crampons to traverse the terrain during the winter. Patches of snow can linger on the trail as late as June. It is possible to hike directly to Telescope Peak from below sea level on the valley floor. However, this path—known as the “Shorty’s Well” route—measures more than 30 miles (48 kilometers) for the roundtrip and requires climbing skills, so only experts should consider it. Make sure to bring all the usual camping and hiking supplies, including a reliable pack, trail map, GPS device, food, and plenty of water. Because this section of the park is fairly remote, it’s a good idea to let some friends know where you’re headed and when to expect you home. If you’ve done all that, you’re set to tackle the peak!